Offer to bring a substantial entree to share that will fill you up and perhaps an appetizer like hummus and carrots, sliced apples, bruschetta, etc. Suggest that the host “hold the cheese” on pasta or salads until you’ve served yourself. For instance, my good friend, Deborah, will serve me some risotto prior to adding the parmesan. Check out my vegan version of her recipe for roasted butternut squash and rainbow chard risotto. Don’t make a big deal of your food preferences. Enjoy and have fun! For work meetings, ask the meeting organizer to include a vegan meal, or if you are going out to eat, suggest a vegan-friendly or ethnic restauant (see below). Plan ahead, especially if you are traveling. Use a site like happycow.net to find restaurants in your area. A search for vegan, vegetarian and veg-friendly restaurants within 15 miles of my home in Los Altos, CA came up with 101! 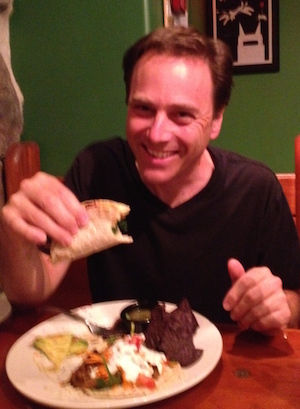 Here are some of my favorite veg-friendly restaurants. San Francisco: Millenium (closing soon) but hopefully re-opening in the East Bay. And Greens is vegetarian SF landmark, opening in 1979, and vegan-friendly. 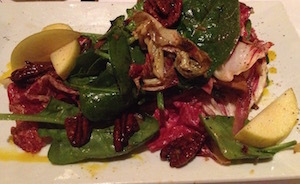 Palo Alto: Califia and Lyfe Kitchen serve meat, but have an entire menu for vegans. 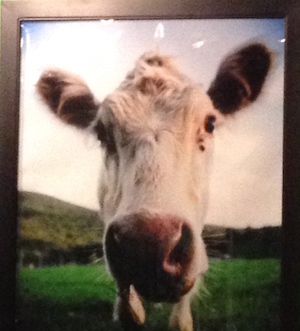 Mountain View and in So Cal: Veggie Grill, a vegan chain, is fantastic and rapidly expanding. Even Chipotle is now offering their braised tofu sofritas. Los Angeles: Chef Tal Ronnen has created Crossroads, a high-end vegan restaurant frequented by Ellen DeGeneres and Oprah Winfrey. Shojin is a vegan Japanese & sushi restaurant in Little Tokyo. Santa Monica: Real Food Daily is a fantastic organic plant-based restaurant that opened in 1993! Manhattan: Candle 79 is a high-end restaurant serving only organic, vegan cuisine. 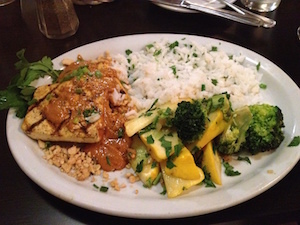 Nashville: The Wild Cow serves delicious vegetarian & vegan fare. Mediterranean – hummus, falafels, baba ganoush, etc. Ask wait staff if soup broth or rice is vegetarian (if it’s not already noted on the menu). Sometimes they will not know and will double check with the chef. Tell the wait staff that you are vegan and seek out their suggestions. Most are happy to assist. And, you can even ask if the chef would be willing to whip up a custom vegan entree. I’ve had some amazing meals that were off the menu and my dining companions were envious! Ask to modify recipes, like pizza without cheese, salads without cheese and so forth. Ask for extra veggies on a pizza instead of cheese, or avocado on a salad instead of cheese. So don’t feel that you need to always cook at home. Share recipes and meals with friends and get out, expore new restauants, travel and have fun! What are your tips and favorite vegan-friendly restaurants? This entry was posted in Plant-based, Vegan, Vegan restaurants and tagged plant-based dining tips, tips on eating out as a vegan, vegan restaurants. Bookmark the permalink. Thanks for the wonderful resources and suggestions! (I see Native Foods, one of my favs, on the list in the Portland area).